I’m covering the map hiding business for MisterK while he takes a much deserved break from his duties, and thought I would save myself a little bit of time by making a fast guide on versioning a map before uploading it. The process has changed a little bit with the release of Downlords uploader and using a lot of older resources can lead to bugs and vault clutter. If you have an issue with uploading or are unsure on what to do: follow this to the letter before asking questions because this will most likely fix your problem. 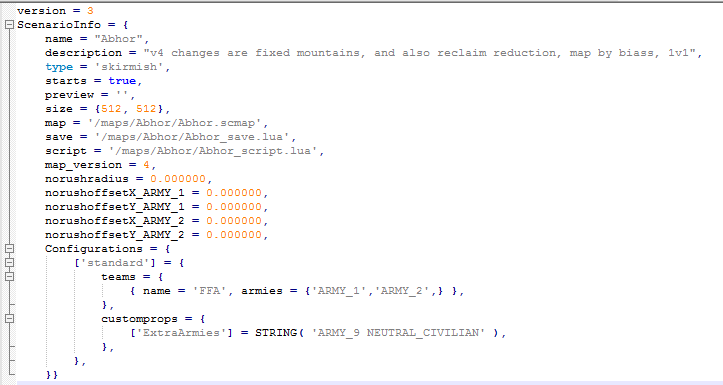 This is the scenario file (in Notepad++, but any text editor is fine) for Abhor, and in this guide I will increment the map from version 4, to version 5. Take very careful note: the older method of adding .v0005 to your files is not present here. This is because the new uploader will detect the version number and change the folder names and other relevant data to reflect that. If you try and add the suffixes yourself you may end up breaking the pathing when it’s uploaded. If you downloaded your map from the vault (for some reason..) in order to update it, just remove the suffixes. STEP one: Increment the map_version number by one. 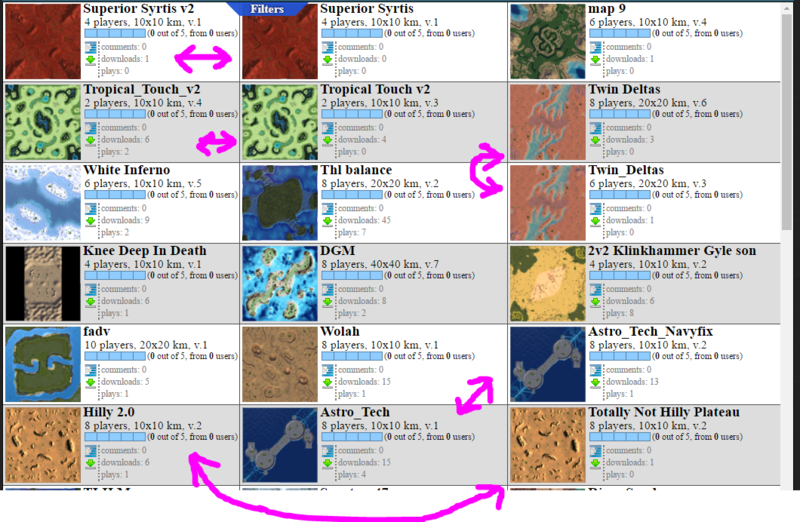 You can see in the 1st image that the map_version was 4, now the map_version is 5. And you’re done! You’ve correctly made a new map version and are ready to upload. “Now biass, i'm not an idiot” I may hear you saying, and while that’s debatable you might question as to why this guide was even made. The answer is simple. It’s not being done correctly. Let’s quickly brush over a few things not to do while we’re here. 1. Don’t put V2 in the map’s name for a new version or better still, don’t rename the map at all. Note the version number and what it changes/fixes in the map description. Uploading a new version properly will both A: push your map to the front of the list and B: hide the old version from the vault, saving a huge amount of time and hassle. While we’re on the topic of descriptions, do put your username in there. So if there is an issue we can get into contact with you faster. 2. Don't use special characters in your map names. There is a number of special characters such as ? “ , $ and etc that need to be reserved for the code, don’t use them in your pathing. It may be possible to put them in the map name (When inbetween two quotation marks, for example “biass’s biceps”) but I highly recommend against it for now. If you had them in your file names and uploading led to errors, you most likely want to remove them to see if that fixes the problem. This will most likely leave an unavoidable broken map in the vault wherein the “Maps and mods” team will need to be contacted. Join, and explain you have either A: problems you need help with or B: a map that needs to be hidden, and someone will get on it. Thus ends the guide. If you have questions ask away, but I recommend trying said discord first. Last edited by biass on 03 Jul 2018, 10:29, edited 1 time in total. From version 0.602 of FAF map editor this bug should be prevented if map is created or saved by map editor. Just don't change folder name, file names or map_version manually. If you have broken map, and you want to fix that bug, then just open your map, and use "save as new version" (no "Save as"!!!) It will create exactly the same map, with higher version and it will be ready to just upload to vault to replace old broken map. If you want to change folder name to different then use "save as". If you chosen wrong folder name it will automatically create other folder with corrected name. - When using "save as" you can add version in folder name (".v0001" or any higher) and map will change its version into that from folder name. - "Save as new version" (it create duplicate with higher version). - Clear files from folder with v0001. Last edited by PhilipJFry on 11 Dec 2018, 11:12, edited 1 time in total.